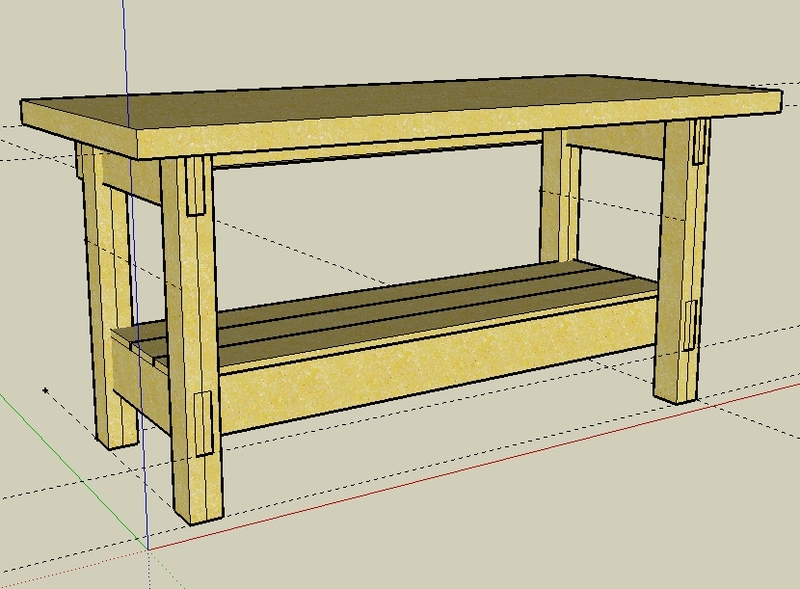 The bench, not including the top, is 32 inches high, 24 inches deep, and 5 feet wide. I started on the legs. I cut 8 2x4s to a length of 32 inches. 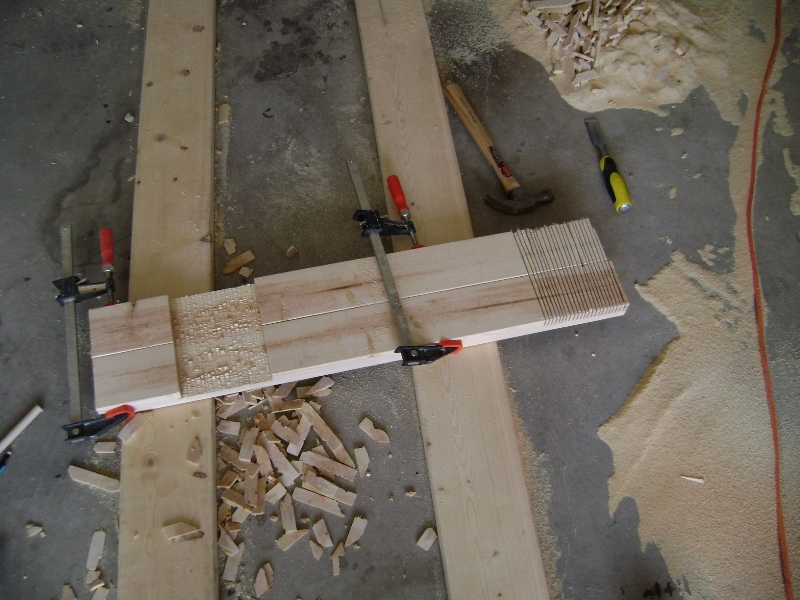 I then used a circular saw to create the dados for the 2x6s. This was the only tool I had at the time. I cut a dado 5 1/2 inches in width. On the bottom part of the legs I cut it 6 inches from the bottom, and then the top 5 1/2 inches. Since a circular saw was the only tool I had to do this, I did many cuts and used a chisel to remove the waste. I used a belt sander and orbital sander to smooth the dados. 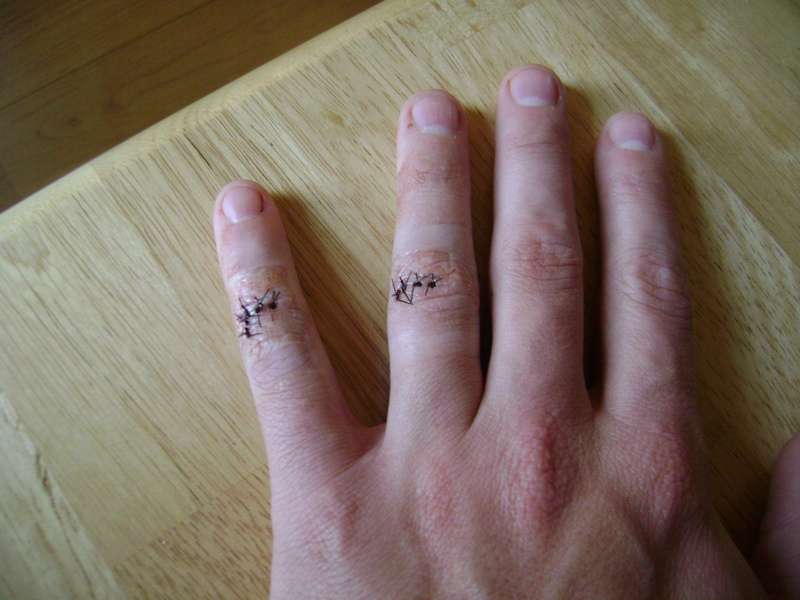 I've never used chissels before, and quickly learned that you probably need to use gloves. My wife was not too happy, and I continued the project after a week of healing. Each side of the bench will have 4 2x4s cut like this, and 2 2x6s. 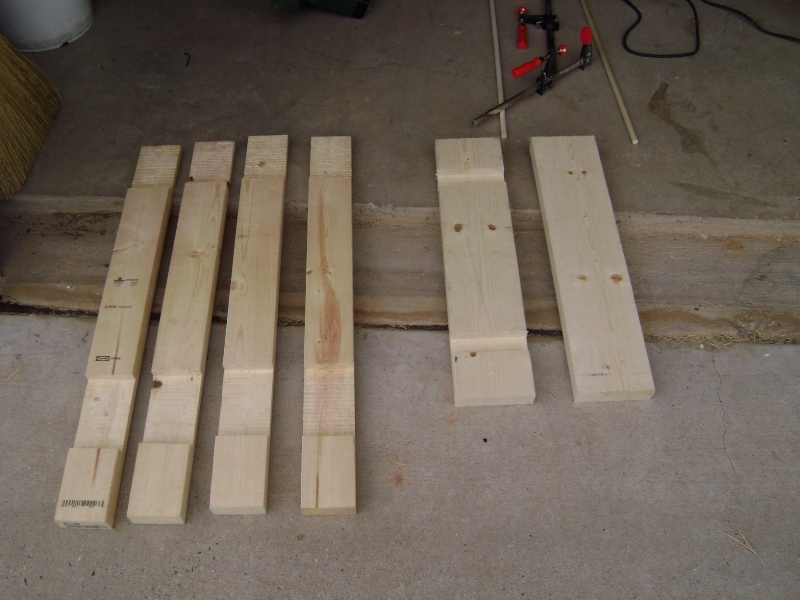 I cut the 2x6s to a length of 24 inches and on the bottom 2x6, I cut 1 1/2 inch dados using the same method as above. They will need to be 3 1/2 inches in on either side. 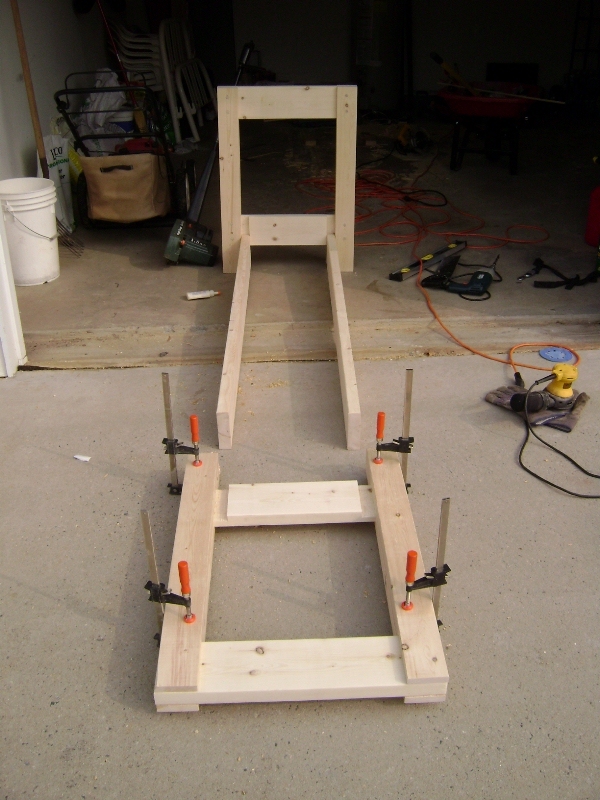 Assembling each pair of legs using woodglue and clamps. 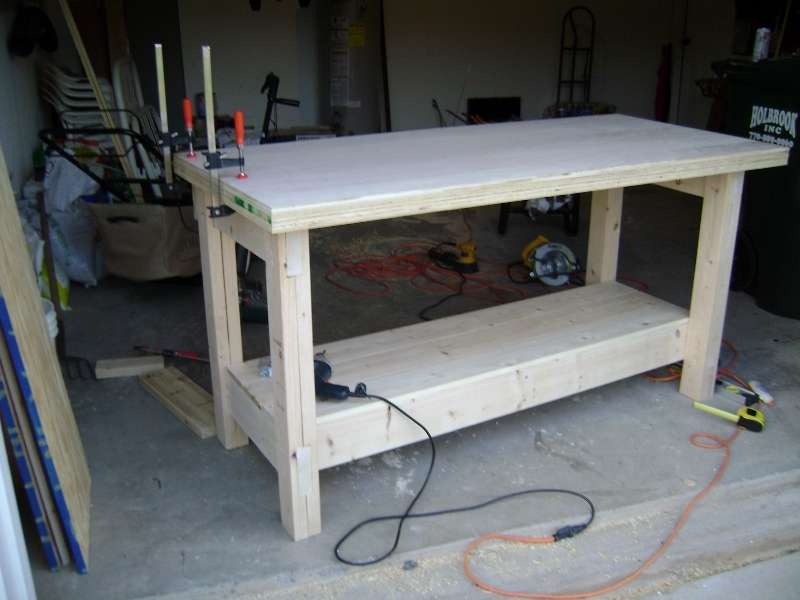 I assembled each side of the workbench using wood glue and clamps. 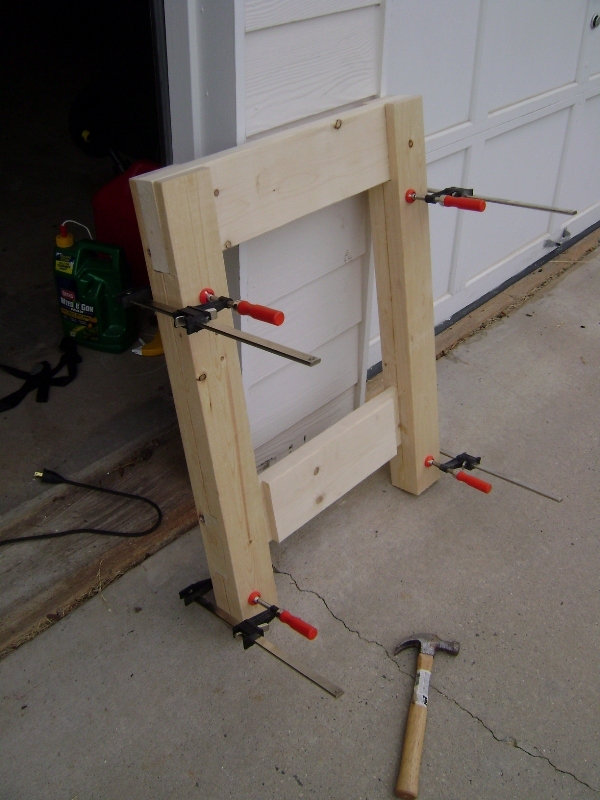 I drilled 2 holes in each joint using a half inch drill bit. Then gently hammered through a 1/2 inch wooden dowel in each hole, cut off the remainder, and sanded down the excess to be flush with the leg surface. 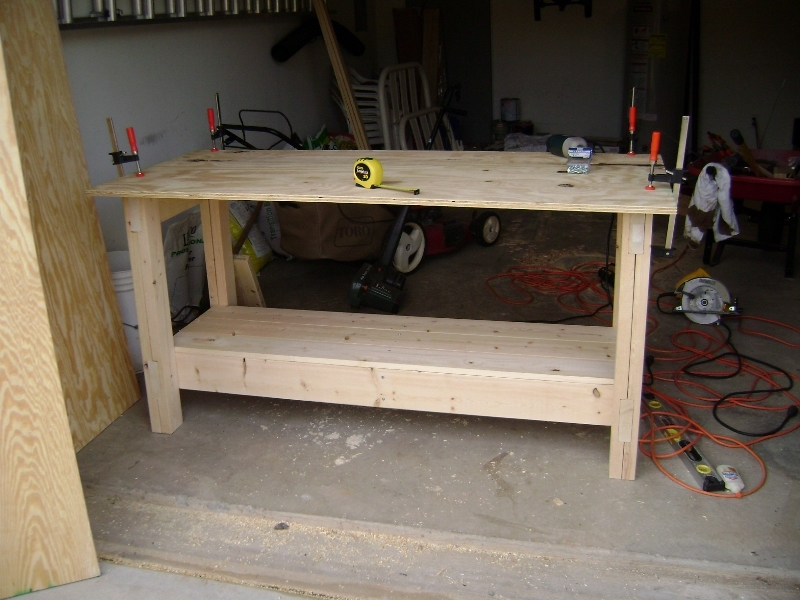 Once each side was dry and solid, I began to assemble the table. 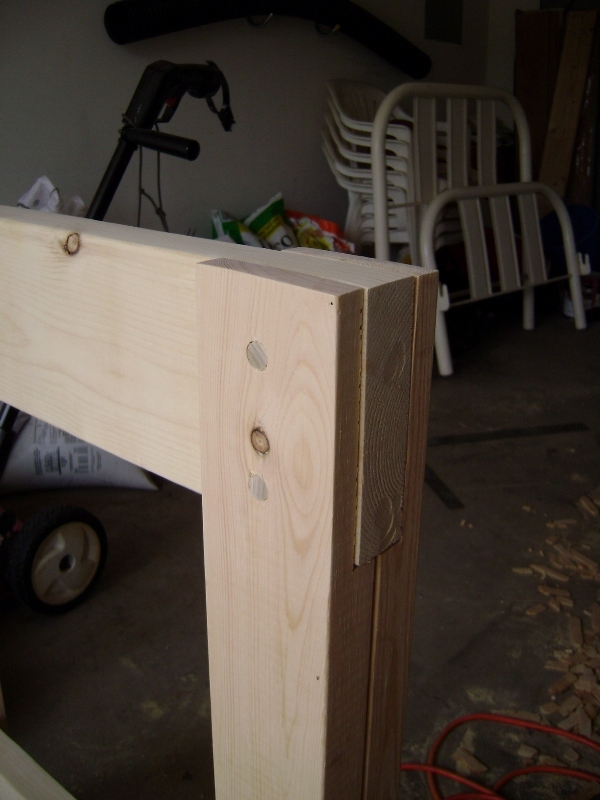 I used 2-5' 2x6s to attach in the dados on the lower portion of each side. 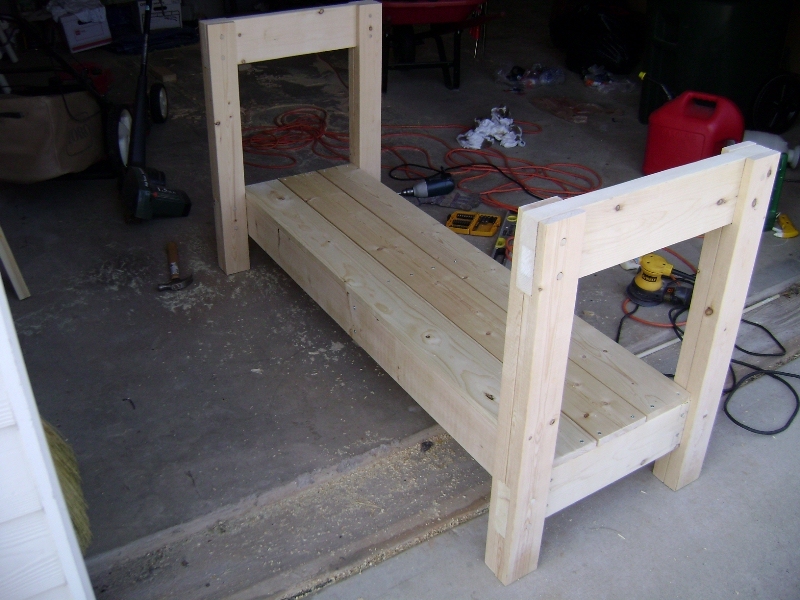 You of course can make your bench as wide as you want. I have limited space in my garage. I used 2 inch wood screwed to secure them in place. Top close up of the legs. 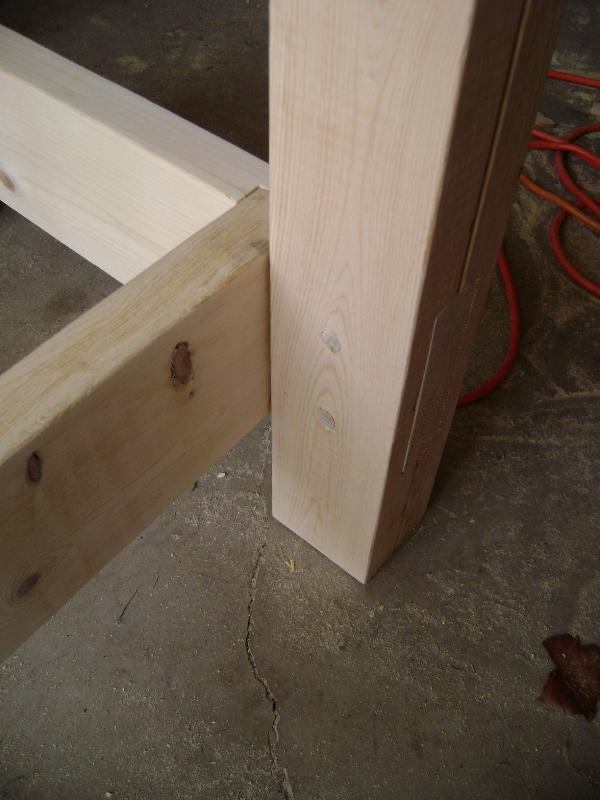 Close up of the 2x6 and the lower portion of the legs. For the lower shelf, I simply added 3 1x6s and supported them in the middle with a scrap peice of 2x6 cut to size. I didn't measure these, but rather placed them on the shelf and marked them where I needed to cut them evenly. 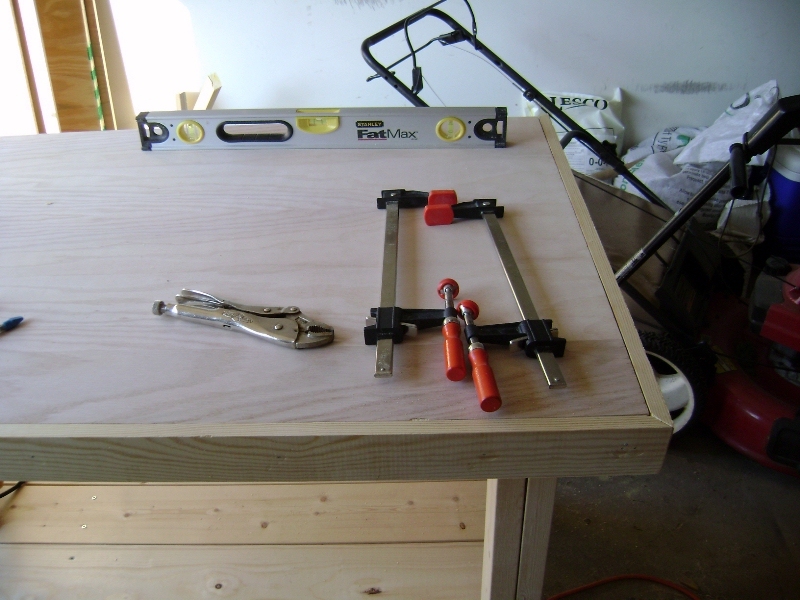 For my top I wanted a nice, solid workspace. I bought 2 sheets of 3/4" pine plywood, and one sheet of oak plywood that would be the top. I don't remember the exact measurements I used for the top but I simply measured the distance between my legs and added 4 inches to the width. The depth would be an additional 2 inches from the back, only allowing 2 inches of overhang on the front, and flush with the back. I screwed the bottom piece onto the bench place using 1 1/4 inch screws. 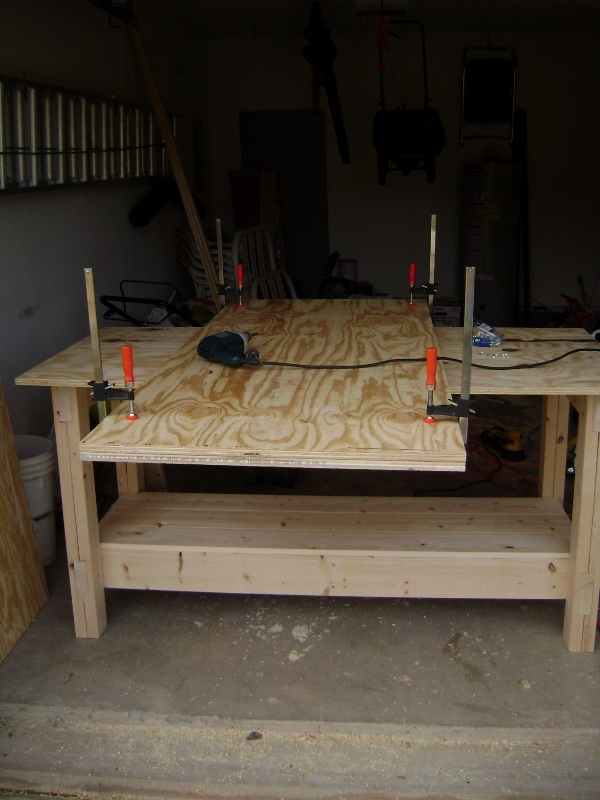 With the other 2 pieces of plywood, I clamped them together, making sure all sides were flush, and used 1 1/4" screws to secure the plywood together. Upside down of course because I want the oak as my top. 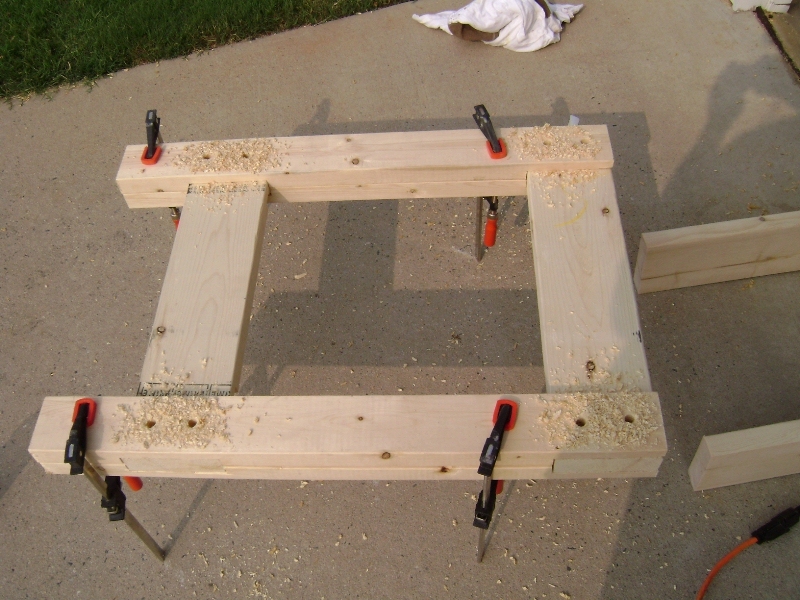 I used 1 1/4" screws so that they would not go through all 1 1/2" of wood. I did not want any screws showing on my workspace. 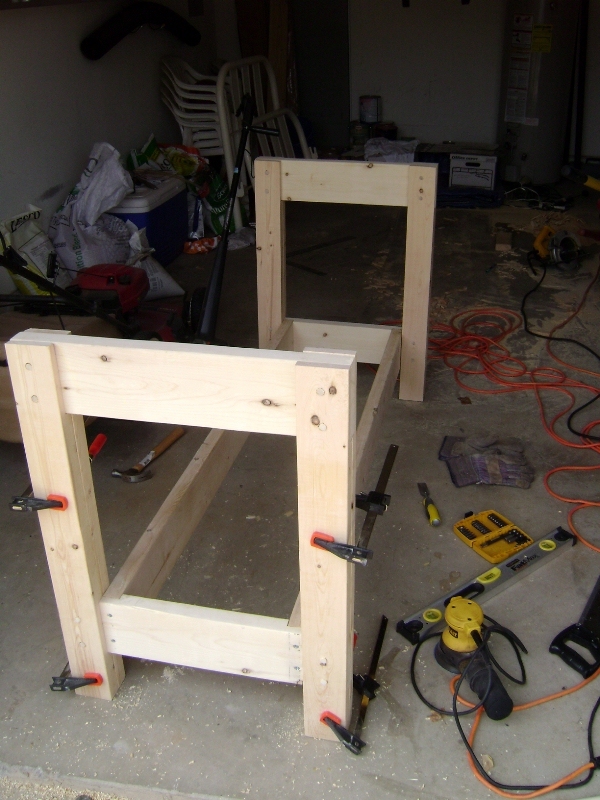 I then turned the 2 pieces of joined plywood over, and clamped them down to the already attached plywood on the bench. 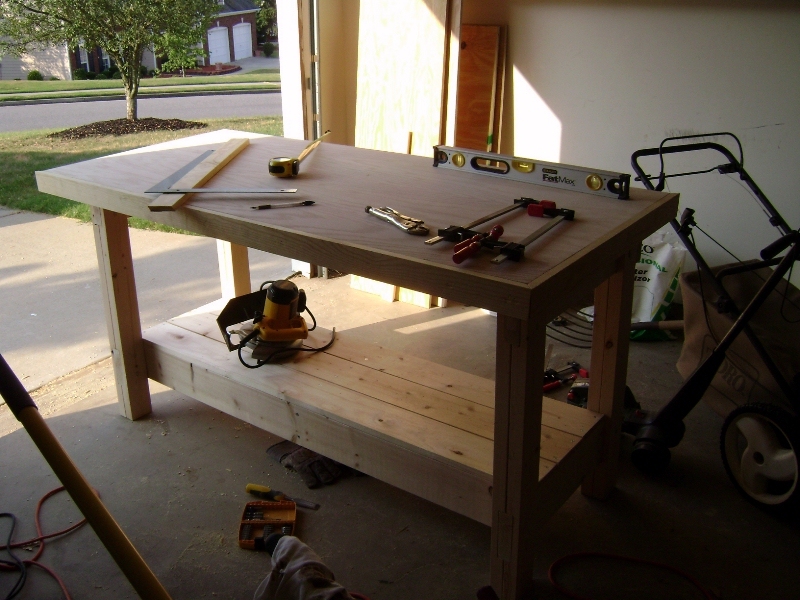 Using 1 1/4" screws again I screwed up from the bottom of the workbench to join all 3 pieces of plywood. This sucker sure will be heavy. The rails or sides of my table top, are 1x3" pine pieces. I suggest using a mitre saw for cutting the 45 degree angles at the corners. I resorted to 45 degree angled cuts using a circular saw. I attached the edges using finishing nails. Note to self, add a finishing nail gun to my Amazon wishlist. I needed a nice pegboard for all of my tools, and I wanted this mounted to the wall, rather than the back of the workbench. I found this pre routed wall material at Home Depot. 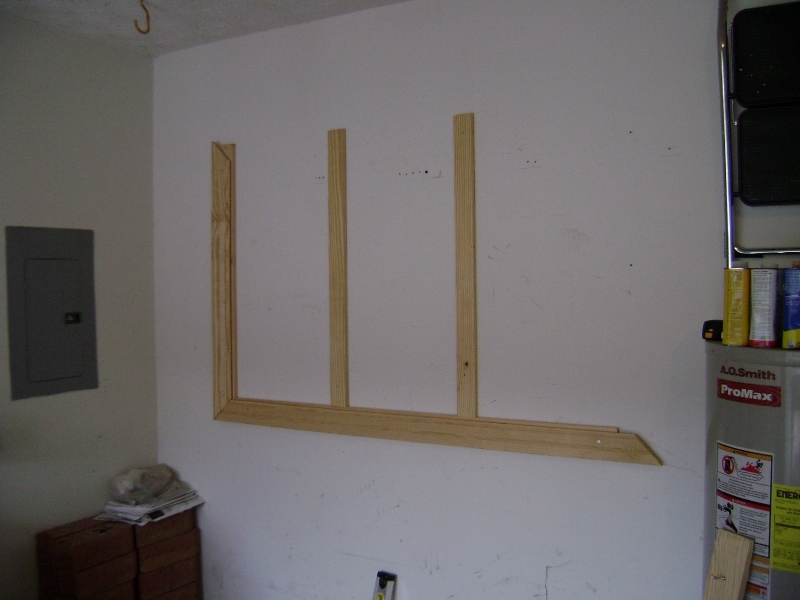 It has a nice route for attaching the planks together when you use them to on a wall. I found that this little routed notch would be great for framing in my pegboard. I raised them a little off of the wall with more 1x3" pine so that the pegboard wouldn't be flush against the wall. 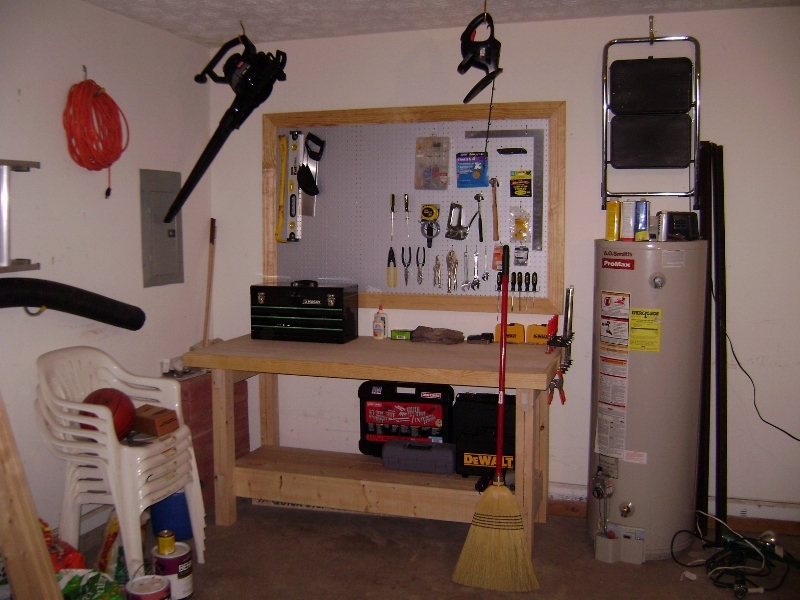 In the picture above, you'll notice that I just put up one side and the bottom framework for the pegboard. I did this so I could exactly measure the other side. 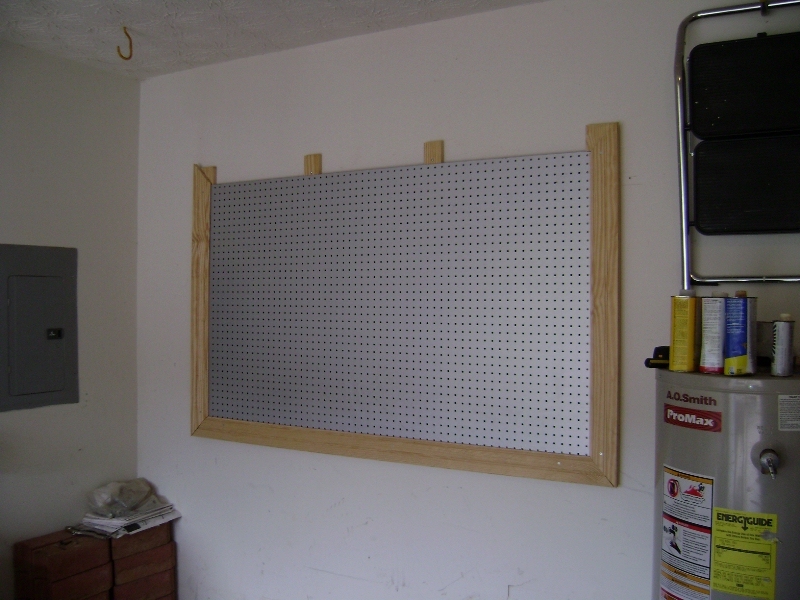 I was right, the pegboard slid down in the routed notches like an envelope. I was very proud of myself. I finished it off with a final piece on the top. 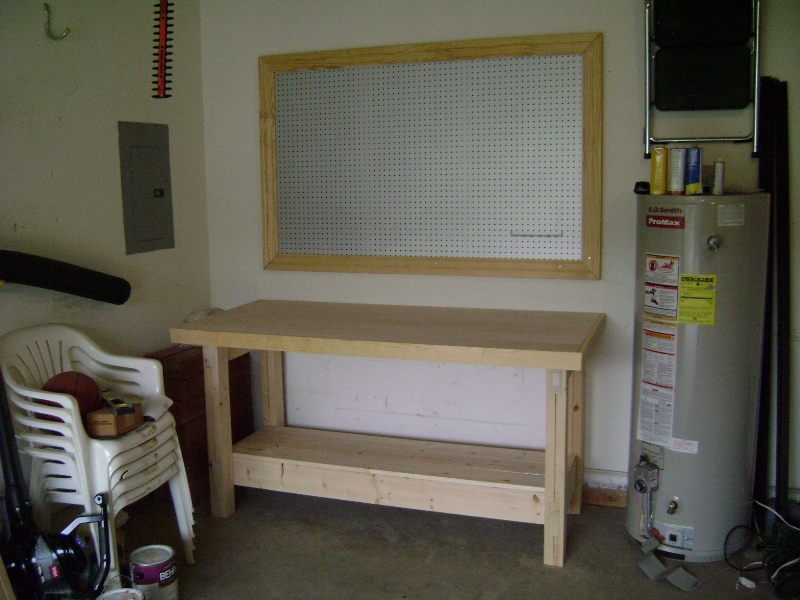 Here's the final bench with the pegboard. And here it is with my tools. Note: The hot water heater is not installed, I plan on moving it upstairs to replace the existing hot water heater. No, I am not storing chemicals or blowing sawdust all around an installed hot water heater. Thanks for those that were concerned. 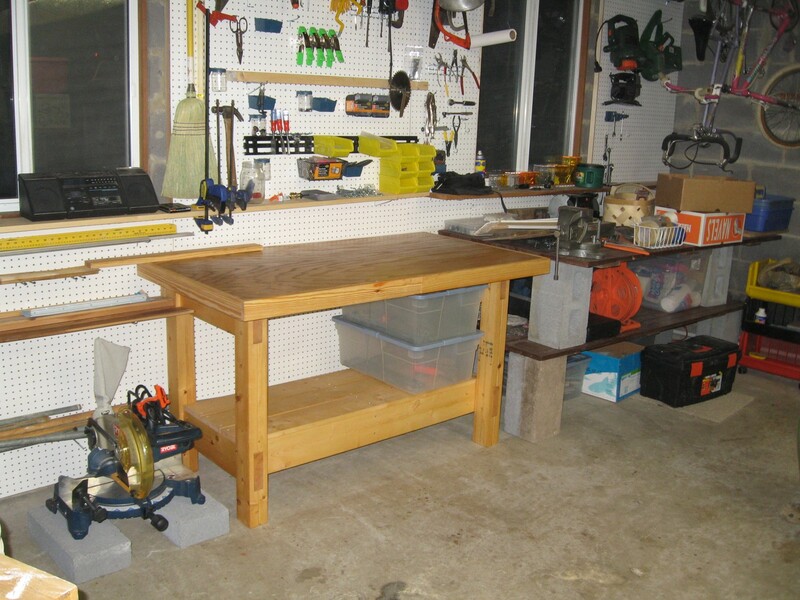 Here is a second workbench that I built my father for Christmas. I put a few coats of stain on it, and like the resulting finish. The oak top has an additional few coats of polyurethane for added protection. I must say it looks a little bit better than his old method of cinder blocks and doors.